The “horns” of the Horned Grebe refer to a yellow patch of feathers on the sides of the head that both the male and female have during the breeding season. Horned Grebes are in Tennessee during the non-breeding season (mid-October through late April), and only some individuals will sport this flashy plumage before they migrate north in the spring. The breeding range is primarily in Alaska and central Canada. During the winter, Horned Grebes are found on the Atlantic, Pacific, and Gulf coasts, as well as on lakes in the southeastern United States. Description: This is a small waterbird with a small flat-topped head, a small straight bill, and a moderately long neck. Most individuals seen in Tennessee will be in non-breeding plumage (September through March), which is black-and-white overall with a large bright white cheek patch, and mostly white neck. In breeding plumage (April-August) it has a black head with a bright patch of yellow feathers behind the eye, a chestnut colored neck, and a black back. In flight they have a conspicuous white patch in the wing. The male and female look the same. Eared Grebe, a rare migrant and winter visitor to Tennessee, has a dark cheek patch, dusky neck, and a thinner and slightly upturned bill in non-breeding plumage. The forehead has a steeper slope, and the head is slightly peaked. Pied-billed Grebe, fairly common during migration and in winter in Tennessee, has a thicker bill, is overall brownish, and lacks white wing patches. Red-necked Grebe, rare in Tennessee, is larger, has a longer bill, and a "dirtier" face in winter. Ducks have flatter bills and do not sit so low in the water. 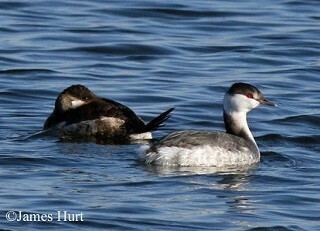 Habitat: In Tennessee, Horned Grebes are usually found on large bodies of water, but sometimes on small lakes and ponds. Diet: Aquatic insects, fish, crustaceans, and other small aquatic animals. 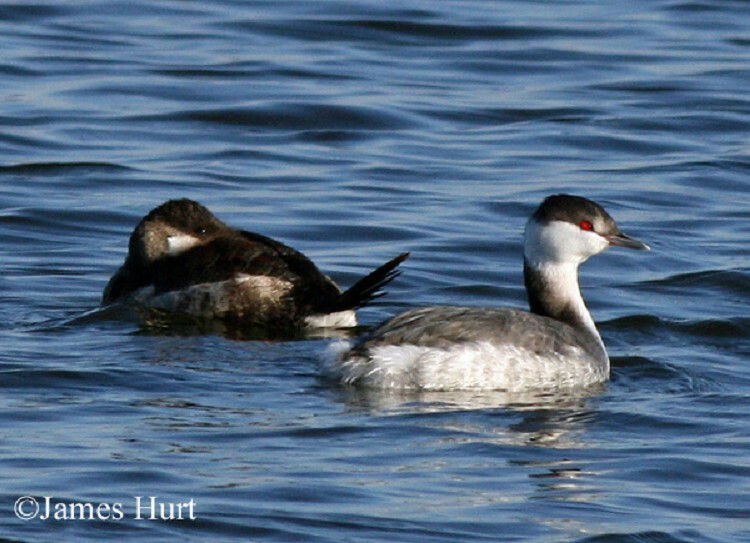 Status in Tennessee: The Horned Grebe is a fairly common migrant and winter resident in Tennessee. They arrive in mid-October and depart by late April. They are usually found in groups, sometimes in rafts of several hundred. Like most grebes, young Horned Grebes often ride on the backs of their parents and have been observed going underwater with them during dives. Horned Grebes regularly eat some of their own feathers, which are not digested but form a mat in the stomach. It is believed that this mat functions to safely hold fish bones while they are being digested. Parents even feed feathers to their young. Best places to see in Tennessee: Large lakes and reservoirs across the state. Stedman, S. J. 2000. Horned Grebe (Podiceps auritus). The Birds of North America, No. 505 (A. Poole and F. Gill, eds.). The Birds of North America, Inc., Philadelphia, PA.